South-east Asian countries have failed to reach an agreement on how to deal with China's claims on disputed territory in the South China Sea. 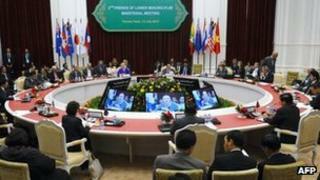 The 10-member Association of Southest Asian Nations (Asean) ended a meeting in Cambodia without issuing a joint statement for the first time in its 45-year history. It had earlier adopted key elements of a code of conduct on maritime issues. China has overlapping claims with four Asean members in the South China Sea. Asean foreign ministers and their regional counterparts from 16 countries, including China, met in Cambodia's capital Phnom Penh for a regional forum. Tension in the South China Sea topped the agenda. The Philippines, Vietnam, Malaysia and Brunei contest parts of the resource-rich South China Sea area with China. The Philippines and Vietnam want Asean to resist Beijing's insistence that the disputes be handled on a bilateral level only. Asean officials said the two countries wanted the joint statement to include references to their territorial disputes with China. The Philippines has accused Cambodia, a close ally of China, of blocking any mention of the dispute. But Cambodian Foreign Minister Hor Namhong said that all Asean members were responsible for the failure to issue a statement. "I requested that we issue the joint communique without mention of the South China Sea dispute ... but some member countries repeatedly insisted to put the issue of the Scarborough Shoal," he said. "I have told my colleagues that the meeting of the Asean foreign ministers is not a court, a place to give a verdict about the dispute." China and the Philippines had a maritime stand-off in the Scaborough Shoal in April, with China denying reports it was preparing for war at the height of tensions in May. Both sides accused the other of trespassing on territorial waters. Vietnam was also angered by a recent call from China for oil exploration in a disputed territory. Earlier this week, Asean forum ministers adopted key elements of a code of conduct on rules governing maritime issues, and presented the proposal for China's agreement. The Chinese foreign ministry had said that China would consider the proposals if the conditions were right. Asean was set up in 1967 by Thailand, Indonesia, Malaysia, the Philippines and Singapore. Brunei joined in 1984, followed by Vietnam in 1995, Laos and Burma in 1997 and Cambodia in 1999.